Painting by numbers, is an excellent way to express your inner creative. Anyone and everyone can paint the masterpieces you see on this blog. With a very seemingly intricate system of a beautifully designed picture the painting by numbers system is easy to pick up. Either following the set-out colours or be expressive and paint the colours you want, both are easily accessible. Our assortment of children’s painting by numbers are fun for the whole family. 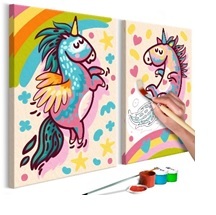 Let your child express their creativity with these wonderful painting kits. The kits are perfect for that special one-to-one time with a young one, the kits are perfect for a budding artist or as an investigative exploration into a new hobby. Painting by numbers is just a fun task, they have been tested to; develop creativity and manual skills in children, teaches patience and concentration, supports motor development, improves the precision of movements and supports hand-eye coordination, stimulates expressive thinking, reduces anxiety and stress level, allows meditative focus and deep thinking, and finally is an excellent hobby. The finished product is excellent as a time piece, something that you have done, a sense of achievement for all to see. Within the sets you get the complete tools you need to create your masterpiece, you get; a printed canvas with the numbered colour fields, 2 brushes with different bristles with different thickness for finer painting, a set of acrylic paints in special containers selected for the individual painting, with finally a diagram pattern with coloured fields to help you paint. 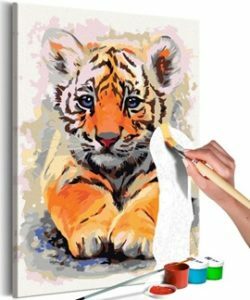 The kit comes with all the above, however there is nothing stopping you from being creative and using your own paint to create your personalised rendition of the canvas.